Water features like ponds, fountains, waterfalls, and water gardens are popular products in the outdoor living industry which is why Blue Thumb focuses on these products exclusively. From small residential installations to large commercial projects, Selena's Landscape, Design & Tree Service has the equipment to get the job done right and within budget, the first time. Nothing draws attention like a well-designed & well-maintained water feature. Whether your focus is on small, self-contained water features or elaborate pond and waterfall systems, Selena's Landscape, Design & Tree Service can help you every step of the way. If space is lacking in your yard or you have safety concerns with a pond then a Cascading Waterfall is your best choice. It’s a waterfall and stream, without the pond. Is a Pond-Less Waterfall Right for Your Space? The small size of a Cascading Waterfall means you can build and enjoy a beautiful waterfall anywhere in your yard- front or back! Because there is no pool of water, a Cascading Waterfall is a great option if you are concerned about safety issues associated with a traditional pond. Cost can be a big factor when considering the type of water feature you want to build. On average, a professionally installed Cascading Falls will range from $1,500 to $5,000+ depending on waterfall size and type of rockwork involved. Operating costs are also less as it’s not necessary to run the pump 24/7. You can set the pump on a timer to operate only when you are home. Taking care of your Cascading Waterfall is easy. Filling the reservoir every few weeks to compensate for evaporated water is all that’s required. Or you can install an automatic fill valve and eliminate virtually all maintenance! Is a Retaining Wall Waterfall Right for Your Space? 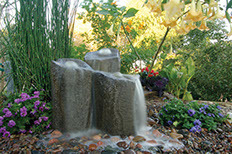 The compact size of a Formal Falls means you can build and enjoy a beautiful waterfall anywhere in your yard. Four different standard waterfall widths are available or a custom unit can be created for your specific project. Unlike a garden hose or protruding plumbing, the Formal Spouts deliver subtle flow with a gentle sound that is ideal for block columns, special focal points and Indoor\Outdoor applications. The installation cost of a Formal Falls is varied and depends on the type of wall material being used as well as the width of the falls you wish to create. Taking care of your Formal Falls is easy. Filling the reservoir every few weeks to compensate for evaporated water is all that’s required. Or you can install an automatic fill valve and eliminate virtually all maintenance! Is a Bubbling Rock Fountain Right for Your Space? 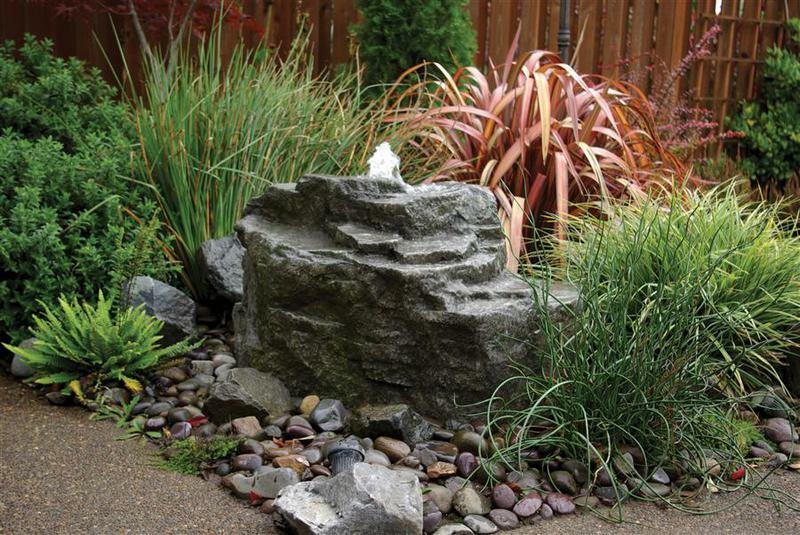 The small size of a Bubbling Rock Fountain means you can build and enjoy a beautiful fountain anywhere in your yard front or back! You can create one in as little space as 36” x 36”. These are great on patios and decks too! The typical professional installation of a Bubbling Rock Fountain will range from $1,000 to $2,000 depending on the type and size of the rock. Operating costs are also less with this style of water feature because the pumps are often smaller using less electricity and can be set to a timer to only operate while you are home. If you live in an area where freezing can occur you will want to simply remove the pump from the basin and store it indoors for the winter. The boulder itself can be left as is on the basin. No need to drain the basin as we recommend the water be allowed to freeze. The rustic stoneware and glazed earthenware fountain vases featured in our collection have been created on pottery wheels, from clay soils, or through the use of press molds. Each hand-glazed fountain vase has an individual character and is a distinctive, original piece of art. Is a Vase Fountain Right for Your Space? The small size of a Ceramic Vase Fountain means you can build and enjoy a beautiful fountain anywhere in your yard- front or back! You can create one in as little space as 16” x 16”. These are great on patios and decks too! Bury the basin into the ground or keep elevated using stone or landscape block. Taking care of your Ceramic Vase Fountain is easy. Filling the reservoir every few weeks to compensate for evaporated water is all that’s required. Or you can install an automatic fill valve and eliminate virtually all maintenance! Consider using safe and effective water treatments to fine tune your desired look. Operating costs are also less with this style of water feature because the pumps are often smaller using less electricity and can be set to a timer to only operate while you are home.. The typical professional installation of a Ceramic Vase Fountain will range from $1,500 to $2,500 depending on the type and size of the ceramic vase. We also offer premium styles which will range from $2,500 - $4,500+. If you live in an area where freezing can occur you will want to simply remove the pump from the basin and store it indoors for the winter. The vase itself should also be drained and either covered or placed in a garage or shed. No need to drain the basin as we recommend the water be allowed to freeze. Fountains require a water collection area to contain both the water and the pump for continuous hassle free use. Column Fountains are great for anyone seeking a larger bubbling rock system that will offer more sound than a single element. Column Fountains create an elegant and soothing tone for a more tranquil setting. Is a Column Fountain Right for Your Space? The Column Fountain systems will require about an 8’x 8’ area. A smaller area can be accommodated but more splashing may occur. The typical professional installation of a Column Fountain system will range from $4,000 to $5,000. Operating costs are also less with this style of water feature because you can set the pump to a timer and only operate it when you are home. If you live in an area where freezing can occur you will want to simply remove the pump from the basin and store it indoors for the winter. The rock column itself can be left as is on the basin. No need to drain the basin as we recommend the water be allowed to freeze.